Stampin' Up! Demonstrator, Mandy Reedyk, Peterborough, Ontario, Canada: New Stampin' Up! 2010-2011 Idea and Catalogue Book is here!!!! New Stampin' Up! 2010-2011 Idea and Catalogue Book is here!!!! Hope you had a great Canada Day (for my Canadian friends) and hope for all my American friends that you have a great 4th of July weekend!!! The New Stampin' Up! 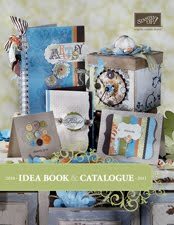 Idea and Catalogue was launched yesterday and let me tell you that you are going to LOVE LOVE LOVE everything about it!!! The colour renovation is fabulous!!!! The colours are to DIE for!!! There are new ribbons, buttons, brads, designer paper, scrappin' kits and of course new stamp sets!!!!... I think I will have to take over hubby's office to be able to fit everything on my list in!!! LOL...for those of you who know me and have seen my craft room will understand why I will need hubby's office to be able to fit more things!! LOL...Please contact me if you'd like to purchase the catalogue or would like to place an order or you can always go to my Stampin' Up! website to place an order 24/7 as well as take a look at ideas and all the current catalogues. I will be holding an open house on July 12th between 7-9pm EST as well and you can take a look at some of the goodies I have purchased from the new cattie, doing a make and take, purchasing a catalogue for $10 (free if you place an order with me of $100 or more before shipping and taxes by July 15th, 2010) as well I will have retired items for sale (at really good prices). Please contact me to let me know if you can make it.